You can use this Boltzmann factor calculator to compute a relative probability of two states of a system at thermal equilibrium. If you want to learn more on the thermal equilibrium and on the Boltzmann distribution (some people call it also Gibbs distribution), keep on reading. T is the temperature (in kelvins). P is the probability that this state occurs. An essential feature of the Boltzmann distribution is that the probability P depends only on the energy E of the state. Boltzmann distribution is central to our understanding of condensed matter. You can check our particles velocity calculator to learn about its close relative, the Boltzmann-Maxwell distribution. Here it is important to note that the relative probability depends only on the difference of energies. For example, two states of the same energy are equally probable. The other factor that plays a role in the Gibbs factor is the temperature. The lower the temperature, the more probable is the state of the lower energy. With our Boltzmann factor calculator, you can test the above predictions. You can also use it to get a quantitative answer. The suitable energy scale is electronvolt (1 eV = 1.60217 * 10^(−19) J) because the Boltzmann constant is a very small number. For example we can ask how much more probable is a state with energy E₁ = 0.1 eV comparing to a state with energy E₂ = 0.2 eV at temperature T = 0 ºC. It turns out that it is around 70 times more probable. In the Boltzmann factor equation, we have to use temperature scale in kelvins. 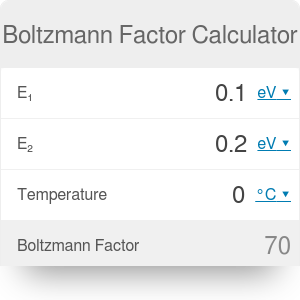 However, in our Boltzmann factor calculator you can use any temperature scale you want, and we will transform it to Kelvins for you. The Boltzmann factor calculator brings us to the micro-world and tiny energy scales. You can check the hydrogen energy levels calculator to get more intuition on the energy scales in that world. Boltzmann Factor Calculator can be embedded on your website to enrich the content you wrote and make it easier for your visitors to understand your message.